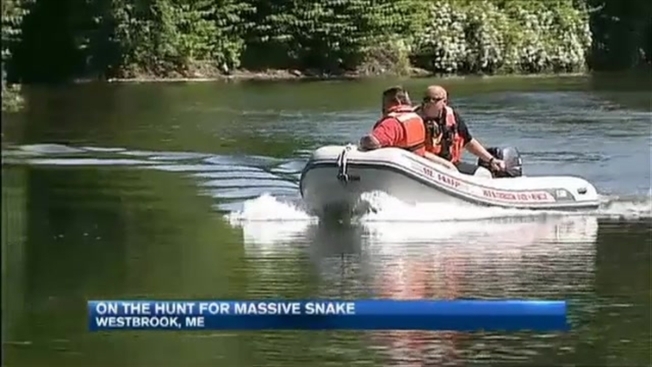 A report of a large snake near a playground is causing quite a stir in one Maine community. The Westbrook Police Department put out a notice on its Facebook page Thursday that there has been a "legitimate sighting" of a snake with a head "the size of a soccer ball," and a body "as long as a truck," in Riverbank Park near the playground. The post quickly took off on social media and now has more than 1,300 shares on the police department's Facebook page. Commenters expressed fear, excitement and skepticism about the possibility of such a large snake in the area. The report prompted animal control officers and firefighters to survey the land and river for the snake Friday, and drew crowds of onlookers attempting to catch a glimpse of the large reptile. "A little six-foot snake doesn't bother me," said Ezekiel Perkins, as he sat on the riverbank watching for a snake. "I want to take a selfie with it," said Stephanie O'Neill, who walked up and down the river looking for the elusive reptile. It caused some parents to keep their children away from the water Friday. "They said it was a pretty big snake, and my kid is little, so I didn't want to take that risk," said Shauna Ryan, who brought her son to the playground. Westbrook Public Safety officials believe a snake this size would not be indigenous to Maine, and suspect it was released near the Riverbank Park. It wouldn't be the first time a large snake was released, and spotted in the area. In 2010, a dead viper was discovered behind a movie theater in Saco. For that reason, fire officials are taking the matter seriously. "We want to make sure if there was something down there, that we potentially locate it and move it to an area where there won’t be as much concern," said Westbrook Deputy Fire Chief Stephen Sloan. Fire fighters deployed boats into the Presumpscot River Friday to search the water and river banks. If anyone sees the snake, law enforcement officials ask you not to touch it or approach it. Call Westbrook Police at (207) 854-0644, Ext. 1.